By 1930, Beatrix had been living on her property in the Lake District for nearly twenty years. She married William Heelis in 1913 and began to focus more on farming and breeding sheep than writing and illustrating her stories. She completed the majority of her stories in the decade after The Tailor of Gloucester and The Tale of Squirrel Nutkin were published, adding just four to the list in the years 1917, 1918, 1922, and 1930. In 1929, Frederick Warne & Co. requested that Beatrix publish another book, so she revised a story that she had begun working on in 1893 after a family holiday in Falmouth, England. Between her busy farming schedule and her failing eyesight, Beatrix did not have the time or ability to write and illustrate a whole new book. Instead, she reworked the manuscript, which had initially been rejected by Warne & Co. earlier in her career, and resubmitted it to be published the following year in 1930. 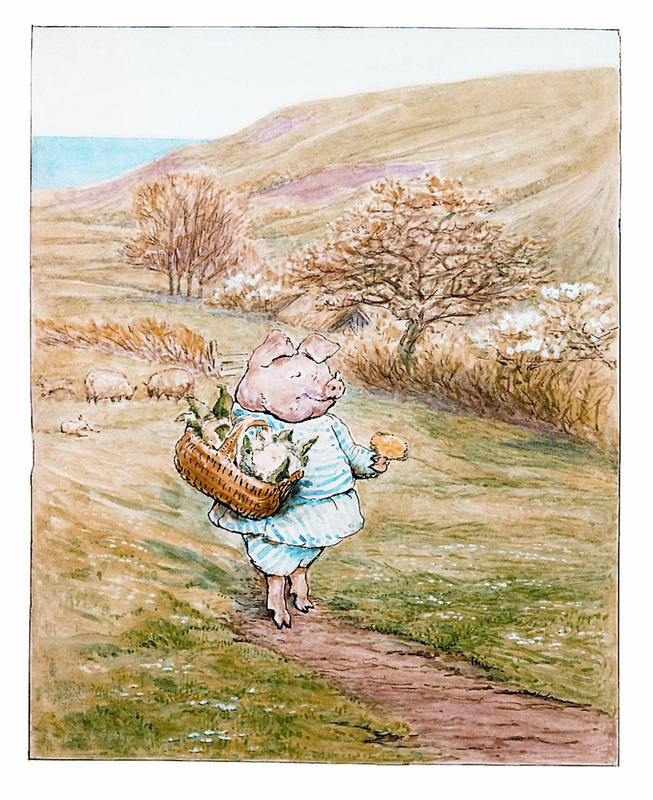 The Tale of Little Pig Robinson has less color illustrations than previous stories by Beatrix Potter, and her artistic methods clearly changed as her career progressed. When she began to write Little Pig Robinson in 1893, she took inspiration from Edward Lear’s poem “The Owl and the Pussycat,” and made it a prequel to that tale.